Liverpool boss Jurgen Klopp said two goals from Mohamed Salah helped his side to a "perfect day" as they eased past Southampton to secure three Premier League wins in a row for the first time in 2017. After a competitive start at Anfield, Egypt forward Salah curled high into the net from 18 yards, punishing Dusan Tadic for losing possession near his own area. The strike gave the home side added swagger and a fine Philippe Coutinho threaded pass picked out an expertly-timed run as Salah prodded the second. No Premier League player has more goals in all competitions than Salah's 14 this season and though he was quieter after the break, Coutinho picked up the mantle to stab home when Roberto Firmino's shot was saved. In all, Liverpool had 21 shots at goal and are the only side to find the net three times against Mauricio Pellegrino's team this season. "It was an open game. We had more chances before we scored and we needed to be patient in a lively way," said Klopp, whose side are fifth, a point behind Tottenham in fourth. "The first goal - wow. I have nothing to do with the goal and the second was a fantastic pass and Mo Salah makes great runs. We could have scored more often but it was a perfect day for us." Southampton, a side perhaps carrying little confidence in their attacking ability given their return of just nine league goals this season, wilted after Salah curled in the opener. Tadic's error was telling but the authority Salah exuded in the finish pointed once more to him being a player of the highest quality - and not the one Chelsea allowed to leave permanently for Roma after just 19 appearances. His second, squeezed past Fraser Forster after a brilliant run on the blind side of his marker to collect Coutinho's outside-of-the-foot pass, took his haul to nine goals in his first 12 league games. That tally is better than that of Reds legend Robbie Fowler, who managed eight goals in the same number of matches - a record which had stood as the best start any player had made to their Liverpool career in the Premier League. The reception Salah got when he was replaced on 80 minutes summed up the depth of feeling the club's fans already have for him. The understanding in Coutinho and Salah's link-up play will surely have pleased Liverpool boss Jurgen Klopp, who allayed fears over his health this week after he was taken to hospital on Wednesday. His side never looked like causing him stress against Saints and, prior to the opener, Georginio Wijnaldum had had a shot saved, while Coutinho had dragged a shot wide. Pellegrino's side often dropped into a 4-5-1 shape without the ball and in doing so allowed Coutinho plenty of possession to orchestrate from deep. It meant his influence could not be limited and by half-time he had touched the ball 45 times. Adding to the dynamic was the fact this was the first time Coutinho, Firmino, Salah and Sadio Mane had started a game together this season and their threat occupied the visitors, who touched the ball just once in the Liverpool area during the opening half. After the break, Coutinho fired wide after again dribbling from deep and Firmino went close twice, once when denied by a timely Ryan Bertrand challenge and later when pulling a low shot inches wide. Salah will take the plaudits and rightly so but Coutinho, who is still linked with a move away, remains fundamental in injecting guile and tempo into attacks. His finish from 12 yards was straight forward and he has now been directly involved in 14 goals in his last 15 league appearances for the Reds. It remains critical they keep hold of him. Southampton, without influential defensive midfielder Mario Lemina through injury, never looked like threatening short of Bertrand going close with a free-kick when the score was 2-0 and a Charlie Austin header that flew over late on. "We started well with energy, with shape and didn't give them too much space to create - but we made a couple of mistakes and it was really difficult for us to come back," said former Liverpool player and coach Pellegrino. Pellegrino looks to have serious work to do as again his attack looked blunt. Shane Long - without a goal since February - did not manage a shot in his 79 minutes on the pitch. 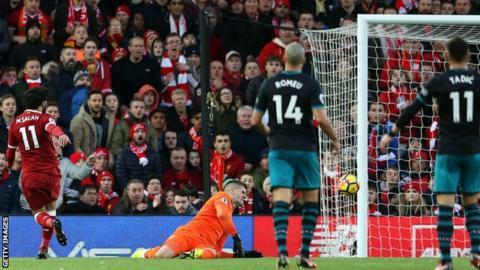 Saints left Merseyside without an effort on target, a flaw in their game which is becoming common and undoubtedly contributing to a run of just four wins in 20 league games. Could finally selling Virgil van Dijk to Liverpool offer funds to strengthen their attacking options? The central defender was solid if unspectacular at Anfield, making more clearances and interceptions than any other Saints player, while also boasting their best pass completion rate of 85%. But there can be no doubt their problems are at the other end. Only twice this season have they managed to score two goals in a game and something will have to give if Pellegrino is to better the eighth-place finish Claude Puel achieved last season. Mohamed Salah has now had a better goalscoring start to a career at Liverpool than any of the club's players in the Premier League era. Against Southampton there was an assurance about him. His curled opener screamed confidence and his run to latch onto Coutinho's pass for the second showed a depth of understanding with another of the Reds' creative sparks. He looks technically and mentally ready to be a consistent difference maker. The Reds have conceded just one goal in their past eight Premier League games at Anfield, keeping seven clean sheets in this run. Southampton have scored only nine goals in the Premier League this term - their fewest after 12 games of a top-flight campaign since 1998-99 (also nine), when they finished 17th and avoided relegation by just five points. Coutinho (31) is now the player with the third-most assists for Liverpool in the Premier League, with only Steven Gerrard (92) and Steve McManaman (58) having made more. The Saints failed to record a shot on target in a Premier League game for the first time since May, which also came in this fixture at Anfield (0-0). Liverpool travel to Sevilla in the Champions League on Tuesday (19:45 GMT kick-off) knowing a win would send them through to the knockout stage. They then host Chelsea in the Premier League next Saturday (17:30). Southampton host Everton on Sunday, 26 November (13:30) and face Arsenal, Manchester City and Chelsea during their next six games. Match ends, Liverpool 3, Southampton 0. Second Half ends, Liverpool 3, Southampton 0. Attempt missed. Roberto Firmino (Liverpool) right footed shot from outside the box is high and wide to the right. Assisted by Alberto Moreno. Attempt missed. Roberto Firmino (Liverpool) left footed shot from outside the box is close, but misses to the right. Assisted by Jordan Henderson. Offside, Liverpool. Trent Alexander-Arnold tries a through ball, but Georginio Wijnaldum is caught offside. Attempt missed. Charlie Austin (Southampton) header from the centre of the box misses to the left. Assisted by James Ward-Prowse with a cross following a set piece situation. Substitution, Liverpool. Emre Can replaces Philippe Coutinho. Goal! Liverpool 3, Southampton 0. Philippe Coutinho (Liverpool) right footed shot from the centre of the box to the centre of the goal. Attempt saved. Roberto Firmino (Liverpool) right footed shot from the right side of the box is saved in the centre of the goal. Assisted by Sadio Mané. Attempt blocked. Georginio Wijnaldum (Liverpool) right footed shot from the centre of the box is blocked. Assisted by Ragnar Klavan. Attempt missed. Philippe Coutinho (Liverpool) right footed shot from the centre of the box is close, but misses to the right. Assisted by Mohamed Salah. Substitution, Southampton. Charlie Austin replaces Dusan Tadic.